Baby and toddler play dates are so much fun. Not only do the little ones get to play together, but the moms get some socialization too. ;) I had the opportunity to host a Bright Starts Little League of Laughers play date for my children and their little friends. 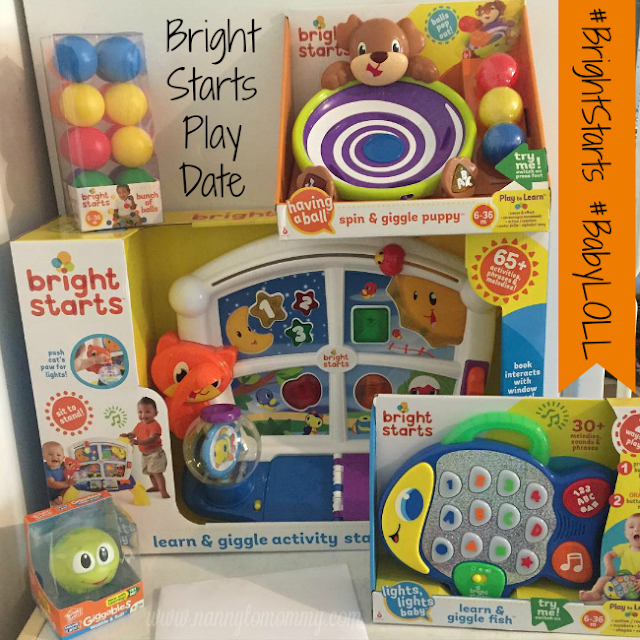 Bright Starts, a toy brand committed to smiles, giggles and happy babies, provided me with these fun toys below for our play date. Our group consists mostly of my kids and my sister-in-law's kiddos, but we do have a few mutual friends and we all like to get together whenever we can. Which was harder this time of year, but it was nice that we were able to make it work. I love the items we received from Bright Starts. The favorite was definitely the Spin & Giggle Puppy. It's mainly for ages 6-36 months, but my now FIVE year old daughter loves it and thought it was hilarious. They used the bunch of balls we received and had a field day. You can view a video of them having a blast with this awesome toy below. I personally had never seen a toy like this one before. The bunch of balls are great because they can be used with all of Bright Starts toys. My youngest niece and son loved the learn & giggle fish. Even my daughter liked when we played "Light Up Dance Party" and just danced around the room to the music it played. Anything that plays music is usually a HUGE hit with the kiddos. I ended up passing it along to my niece because she loved it so much. The Giggables are by far my son's favorite. He LOVES throwing rolling balls across the room, so this one was a huge hit. We'll work on his aim outside though. While checking out some of the products before hand, I saw all the different designs and they are so cute. And I love the silly sounds they make as they wobble and roll across the floor. Last, but certainly not least, was the Learn & Giggle Activity Station. With ages 6 months to 3 years in mind, little ones can sit or stand to play with this. It's different than other activity stations I have seen. It has flip book pages, light up buttons, and fun noises, but my favorite feature is if you push down kitties paw then the fish bowl goes around and around. We have been a huge fan of the Bright Starts brand of a long time and these newest toys confirm that! If you would like to follow Bright Starts on social media, they are on Facebook, Twitter, Pinterest, and Instagram. We have also included these toys in our Holiday Gift Guide. Do you get together for play dates? 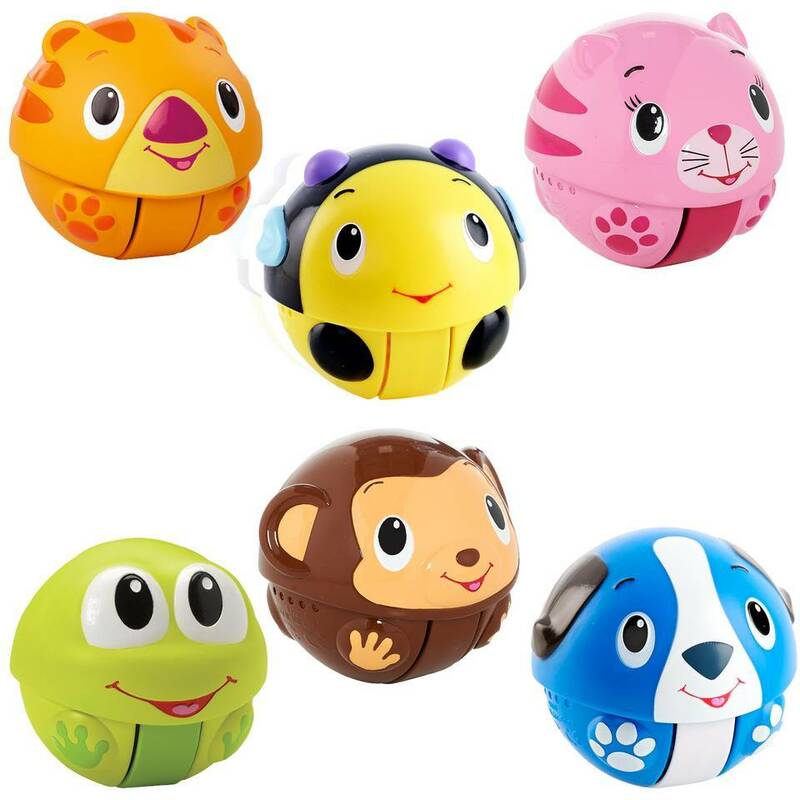 What do you think of these new toys from Bright Starts? Cool toys, i enjoyed watching them play. Looks like lot of fun to play and these are perfect holiday gifts to make kids smile! 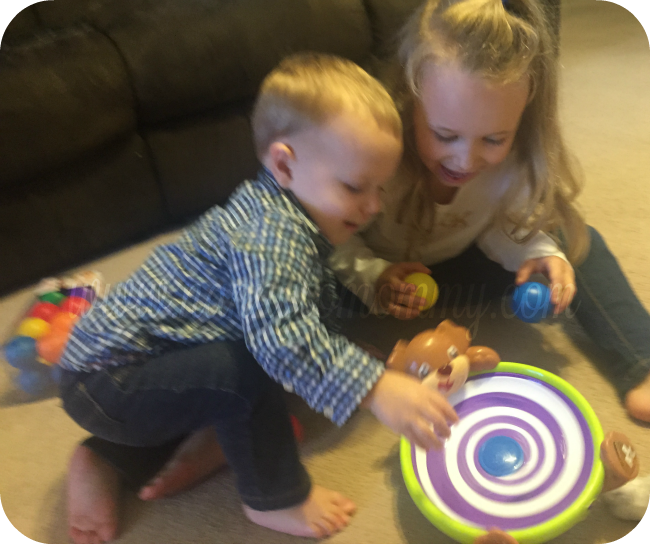 We love getting together for playdates and these toys look so fun! My sister has really been struggling with what to get my 2 year old for Christmas I'm totally going to show her this post! These toys look so colorful and fun! I have a few little nieces and nephews who will fall in love with these toys.